What do you think of when you hear the word “holy”? Most would say “I think of God”. That would be a logical response; God is holy. Our next two verses charge us as Christians to be holy. Now, what is your first reaction to that bit of news? It is likely we would say “not possible”. God’s word says it is, in fact, it is a command. Wow, what a challenge. Where do we start? Actually, we already have. These two verses come on the heels of several statements. In other words this isn’t a new thought, it’s a summary. Let’s review, in the last few verses we were told to be calm and level headed, prepare ourselves to go to work, in other words focus on Jesus, clean up our mind, keep positive, be obedient children submitting to God, don’t look back to the old life of sin and finally, in verse 15, we are told to by holy in all our conduct. Christians should be easy to spot; they do their best to please God all the time. When you see someone act one way in church but are altogether different outside of church you may be looking at a pretender. Let’s go back to the “obedient children” comment: Have you ever seen a boy try to imitate his father? When my son was little he had a toy lawn mower and he used to follow me while I mowed the grass. He was trying to act like me. Peter is challenging us, as God’s children, to act like our Heavenly Father, to imitate Him. If we say no one’s perfect, I cannot be as holy as God then we are missing what Peter has said. God is not going to ask us to do something we cannot do; we have been commanded to be holy. Peter is challenging us not to act like the world; we are to act like our Heavenly Father. We see holiness as unattainable. Why? Is it possible that we don’t fully understand what is being said here? I will wait for the sequel. .:) great post. 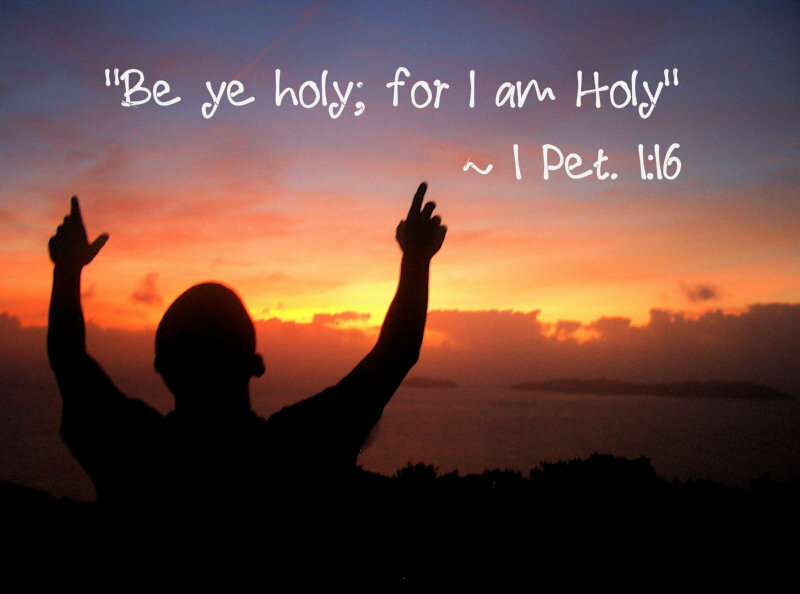 Just be Holy. Blessings. Thanks Karina, I wrote them at the same time but didn’t think a 900 word post would go over well. Reblogged this on ABUNDANT LIFE LIVING. Being holy or trying to be is a lifelong endeavor and the best goal we could ever strive for. I liked this post a lot. Great motivator!! Makes me want to be holier each day. Thank you Katie. It is a challenging subject to deliver and live. I like the thought: be like your Father. That’s so encouraging…just to know that we belong to one another; then, that I should strive to be as great as he is. Thanks Michael, I appreciate the thoughts. There is only one source for holiness so you might be on to something.